In her twelve years in office, McKeithen has built little. Instead, she seems to have made it a priority to break things, particularly individuals, including fellow council members, town staff and others who oppose things that she wants. 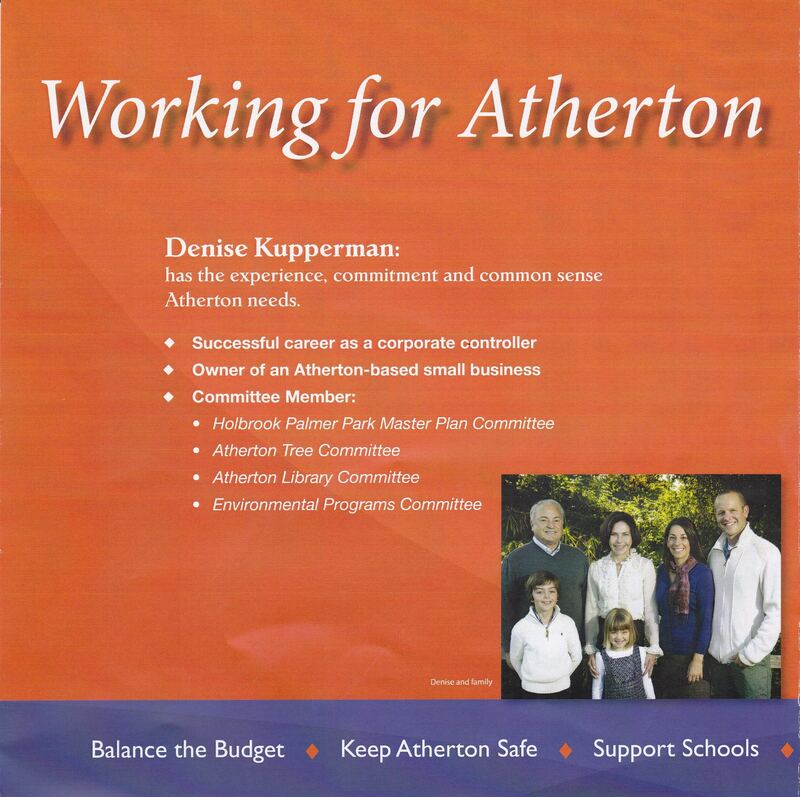 She hasn’t done anything to significantly improve Atherton that I am aware of. She has successfully squandered much town money opposing town-supported development efforts (like the PAC), and has attacked and pushed off multiple initiatives to revitalize the town center — merely by accusing those trying to move that effort forward of being “developers.” So disdaining of opportunity of do anything to improve the town center, one would think she liked seeing it growing increasingly shabby . . . which maybe she does. Thus, it shocked many of her former supporters when, as a big change of her whole orientation in which she had steadfastly opposed all improvements to Atherton, they found that McKeithen ardently and passionately supports the desire of the County Librarians to complete a massive development for a new Atherton Library—not where the town wants it (where it currently has been, in the town center), but smack in the middle of the town park! 1. By winching the library out of the town center, she can cause one town building to be abandoned, possibly creating true urban-like blight in self-identified “rural” Atherton. 2. Without the Library as an anchor structure, she can throw a big wrench into the existing Town Center Task Force’s efforts to revitalize the town center, since not having the library there may well reduce the ability of that group to raise private funding. It will also greatly diminish the ability of that group to build decent community meeting space, which the town desperately needs—in the town center—since the library won’t be there to share the cost of building that kind of space. 3. 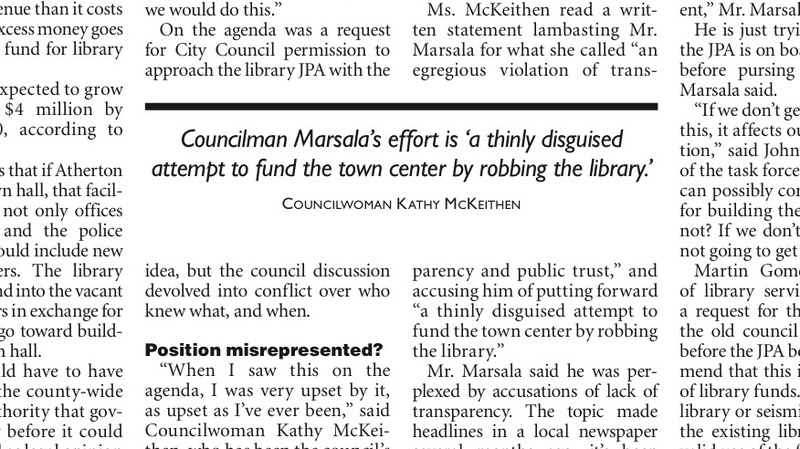 Lastly, in the kind of quirky logic that only Kathy seems capable of, it appears that by aggregiously denying residents any say at all and then going to war with the whole town to suppress all the controversies she herself creates, she’ll be flexing those all-powerful council muscles and showing her County Library buddies that it is her doing that allows them to build their white elephant in Atherton’s sole park, over all of the objections of the whole community. In this way, Kathy can get on the good side of the team that holds all of the tax money and she’ll be viewed as a library hero. This will really help her chances of possibly getting her name put on the library and not even have to contribute a cent!